Hiral qualified as a dentist from Gujarat University India in 2006. She came to the UK and registered with the General Dental Council after completing the qualifying Overseas registration exams (ORE) in 2009. 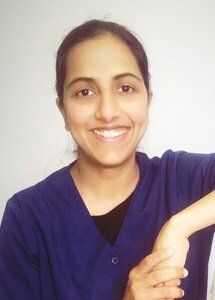 Since then Hiral has also achieved the membership of Joint dental faculties (MJDF RCS Eng) in 2011 and successfully completed the Post graduate diploma in Conscious Sedation in dentistry from Newcastle University (merit) in 2013. Hiral did VT equivalence in Isle of Man where she worked with in the salaried dental services providing dental care for children and adults. After that Hiral worked in St Andrews – Scotland for 4 years, again with in the salaried dental services providing dental care to special needs patients and those with dental anxieties. Her area of interest in dentistry remains the dental care of anxious children and adults and those with special needs. She continues to work with these patients and provides inhalation and intravenous sedation where necessary at Torrington dental practice since 2014. Along with this Hiral also works for the Community Dental Services in Devon.